Come in and browse our library. 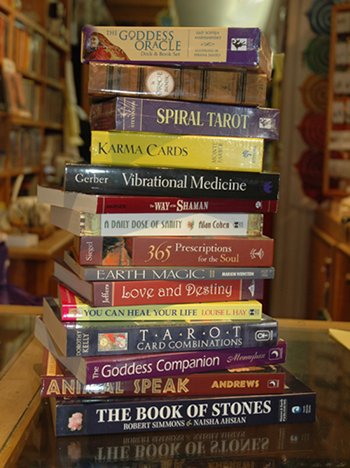 We carry a wide variety of books, tarot and oracle decks and cards from all your favourite authors, in a wide variety ot themes. We also carry a selection of books on CDs and and some very fine leather-bound writing journals, as well as a selection of themed calendars and datebooks. Tarot Cards are used to give you answers to questions about your life. They can be positive or negative. Tarot cards are more like a game and are great for beginners. Oracle Cards always provide positive insight and outlooks or more importantly guidance. They are much more accurate and spiritual and mostly used for fortune telling and personal readings.